1 cedar bundle. To use a smudge stick light the end, gently blow out the flame when you feel it's good and lit. Slowly wave the herb bundle in circular motions as you move around the room, person, or object. Use a fire safe dish to catch any fallen ash. When you are done extinguish your herb bundle by tamping it in a fire safe bowl. Approximately 9" long. 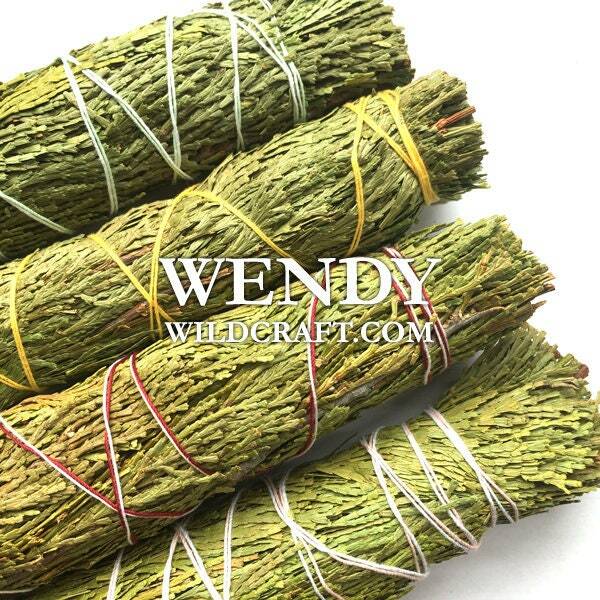 Herb bundles can also be known as smudge sticks. Wendy, thank you so much! The packing was beautiful, shipped safely, nothing was crushed, shipped with love. Fast shipping! I will be shopping here from now on! I found my smudge stick supplier. Love the organic no fluff beautiful packaging. Nice size smudge sticks for a great price. The aroma of the cedar smudge sticks is truly divine...definitely repurchasing! its not aromatic like west coast cedar.